Both the actively applied Camera filters and the later added Photos apps based color filtering in iOS can add some nice stylizing effects to pictures, helping to give them a unique look, but if you decide you’re no longer wanting an image to be filtered through a crazy color lens, you can actually easily remove the filter from the picture and restore it to the original untouched version. This removes the filter from the image completely, restoring the unadjusted image the version that is now visible within the Photos app of iOS, as if the filter was never there to begin with. 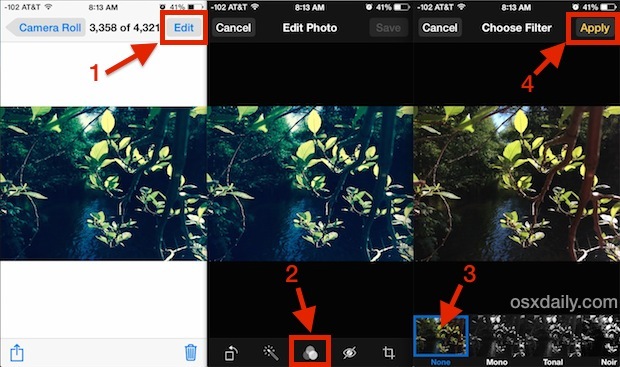 Of course this only works to strip a filter that has been applied through the bundled iOS filters, either through Camera app or through Photos app, on an iPhone, iPad, or iPod touch with a modern version of iOS. This will not strip a filter applied through third party apps like Instagram or Afterlight, or a filter that has been applied elsewhere and then sent to an iOS device, in those cases you’d probably need to do much more advanced image post-processing on a computer with apps like Pixelmator or Adobe Photoshop to manually restore the images coloration, a much more complex task that wouldn’t result in the original image in the same way. I had a bunch of Christmas photos that I accidentally had filters on when taking. Was able to put them back to normal so I can share them with Family. Thanks for sharing this. Thank you so much! I had this great picture of me and my little nephew, but he selected the filter in negative! I can finally get it back to normal! Thank you so much!!! I did all of this but all the other options when I click the other filter circles only show other black and white photos. I want to bulk change lots of the photos in my album. Can I do this? If so, how? Thanks. Wow, after reading this post it’s really so easy for me. 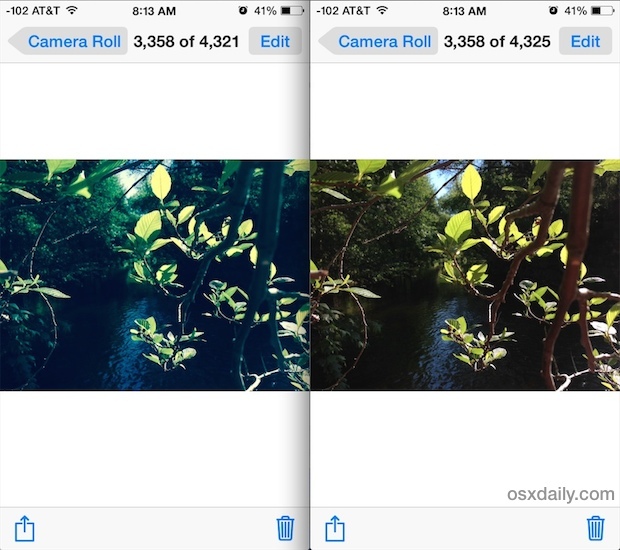 Now I can easily remove the color filter from photo ios. Thank you so much.